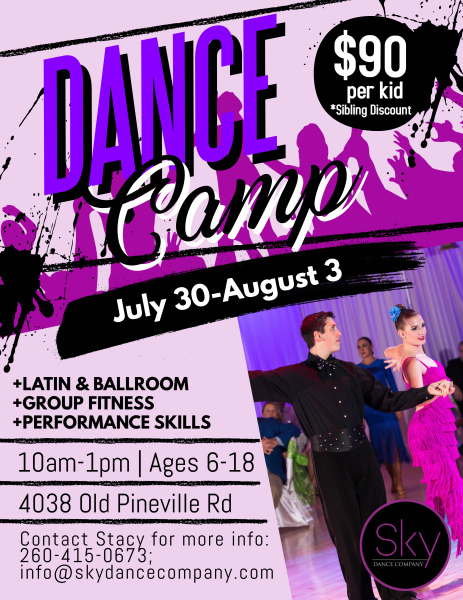 Sign your kids up for a week of dancing, exercise, and positive socail interaction at SKY Dance Company's Summer Dance Camp. This camp is open to all kids age 6-18. Dancers will be separated into groups by age and skill level to provide an optimal experience for each child. No prior dance experience or partner is necessary. The classes will be focusing on Latin and Ballroom dances, as well as a variety of other dance styles including jazz, hip hop, and more. The camp is a great way to introduce new students to dancing in a fun environment. Kids who dance together share a strong bond and develop long-lasting friendships!